It’s time to take America back from everyone who does not speak English, even on the Internet. At least, that is one of the most important issues facing this country according to GOP candidate Bill Binnie, who is vying for the New Hampshire Senate seat up for grabs due to the impending retirement of Republican Senator Judd Gregg. No more LOLs or RTs or obscure emoticons. No speaking Mandarin on the Internet, even though the Chinese outnumber English-only users by miles. No more tea party protesters holding up grammatically incorrect signs with spelling errors. In his latest campaign advertisement featuring mostly Caucasian children in a classroom, Binnie touts that “for our kids to prosper and succeed, they must speak English” and goes on to note how English is important to commerce, science, and even the Internet. Forget about jobs and the economy. The number one problem facing our generation is that our kids don’t speak English. I can agree with that, but Binnie is more concerned about the fact that brown children do not speak English, as opposed to the fact that most American children are not getting the education that they deserve. Binnie clearly has a lot to worry about. New Hampshire is only 94% white and non-Hispanic. It is so homogeneous that every person who is non-white clearly stands out. It must be quite scary for Binnie to see how his state is changing over time, one Latino at a time. Ironically, we must give thanks to the British for their thorough colonization, since no other language in the world commands such universal hegemony. 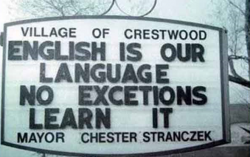 English does not need any help from Republicans to prosper as a language, although the ones who speak Teabonics may need some help speaking English. It’s amusing to see American citizens screech and squeal about speaking English-only when most of their ancestors who immigrated here from Europe never learned the language. One of the iconic founding fathers — Benjamin Franklin — was particularly concerned about the “swarthy Germans” that could not communicate in English and warned that they would overrun America, in much the way anti-immigrant individuals squirm and worry about Spanish-speaking immigrants taking over their country nowadays. The idea that “Americans should have allegiance to one flag, and one official language” goes against the idea of America as a country founded by immigrants (not to forget enslaved African-Americans who never chose to immigrate here, along with the extermination of millions of indigenous peoples with rich cultures and multitudes of languages). English is an imported language in America, and a version of it — American English — just happens to be the language most of us use to communicate across our various cultures and backgrounds. Lacking basic knowledge of a language such as English does hamper our ability to succeed to some extent. But it is knowledge of more than one language that breaks down the walls of (in)difference, makes us more competitive in the workforce and prosper in global trade. Binnie should make a note of that.